Eco-Babyz: Eco-Babyz is Going Carbon Neutral! Eco-Babyz is Going Carbon Neutral! Blogging comes with its own pros and cons. As a green blogger there is even more to consider, like the environmental impact of your blog or website. Sure, one blog doesn't do much, but there are thousands! It all adds up with your energy and resource use. The best way to offset the damage? Uhm, maybe plant a tree and a vegetable garden in your backyard! Since we don't have our own backyard we thought it would be great to have the Arbor Day Foundation plant a tree for us. Did you know that the CO2 absorption of a tree is approximately 11 lbs per year? Works out quite well because the CO2 emissions of a blog are about 8 lbs per year. 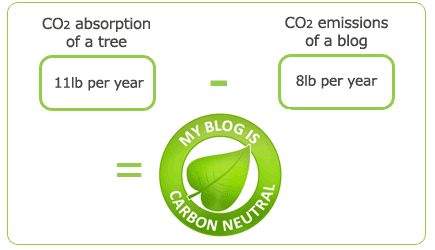 So now we're proudly displaying our "My Blog is Carbon Neutral" badge! 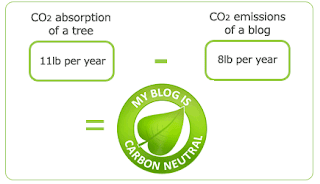 Find out how you can make your blog carbon neutral too!